Forum Home > All Forums > Regions > Wales > R14 - South Wales > Pain And boredom..... the consequences ! Pain And boredom..... the consequences ! Hi, since I recently introduced myself to the R14 region, as a new member and owner of a 944 Turbo things have moved on. Recouperating now, having had a hip replaced last week. Everything straight forward and no more pain. Boredom + laptop = consequences. 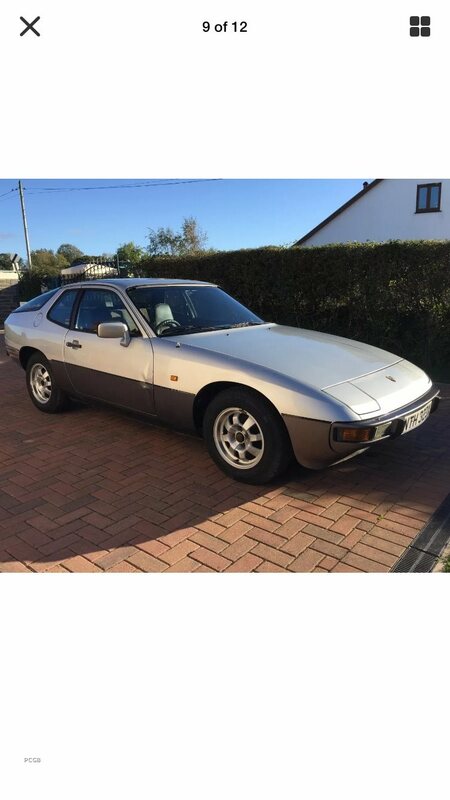 My eye was drawn to a metallic maroon 924S with substantial history but tatty interior and would benefit from paint. Before I knew it the ‘button‘ was pressed and it was mine. A conversation with my son revealed a full interior to have been identified. Another ‘button’ pressed and it was mine ! I contacted the vendor and found the interior to still be fitted in the ‘donor‘ vehicle. A little while latter and without pressing any buttons at all, the car was mine. (how did that happen). It was a white, 1985, 944 bodied 924 which had been a project. Oh well, a nice car, now with nice interior and plenty of spares. But then fate struck again. A 1986, 924, Spares or Repair. A conversation with the vendor revealed the car to have had a lady owner since 1986 with a substantial Service History. The ca was taken for its MoT in 2010, passed, and was also serviced, cam belts and tyres renewed. However, at this time the car suffered minor damage to the drivers door, it’s creased, where it appears to have swung open. Only 2 more consequences now ! The first, the 924 was returned to its garage and not used again. The second. Another button pressed and, you’ve guessed it, it was mine. There is a morale to this story, but I can’t remember it, as I don’t remember buying these due to the effects of the pain killers. Ha, you won't be bored any longer, Stocky. Sounds like you're quite pleased with your purchases, really, and why not? I think you're right. Could be a bit of fun trying to sort these out.